Since starting running and going to the gym, I have noticed something: whilst women were working out to the beats of their music, for many it wasn't just their arms swaying, but their busts too. It's been painful to watch. I would head to the changing rooms where I noticed women would slip out of their work clothes and into their sports gear without changing into sports bras. I have sighed and I have cringed. Girls, it is time we have this talk today. For this reason, I decided to write my second post in my blog's short series of What a Girl Needs, for which I have collaborated with Shock Absorber. Why do we need to wear a sports bra?, I hear you ask. If you are blessed with a big bust, a sports bra straps those babies in so they don't smack you in the face while you're exercising. Well, ok, I can't imagine someone's bust smacking them in the face, but the point about them being strapped in is important. A good sports bra will pack them in tight like Houdini's straightjacket, they won't move much. From the moment I hit puberty, my mum sat me down and told me why I should wear a sports bra. My first sports bra was white and from John Lewis. It looked like a normal underwired bra but it was the most uncomfortable bra I ever owned (and I have a mahusive bra collection!) Whilst they strapped in my bust tight and was great for when I played netball on the school teams, the presence and feeling of the of the wires just made me so aware of the sports bra. It put me off wearing sports bras and that in turn put me off sports in general because I thought all sports bras were underwired. Then one day, I was browsing through the lingerie department at Debenhams, when I saw this yellow and blue Shock Absorber sports bra. It sort of looked like the top half of a swimming costume. It claimed that it was designed for those blessèd women who wanted a non-wired sports bra. Ooooh a non-wired sports bra for someone like me? I've never worn a non-wired bra. So I bought it and tried it on. I went for a short run. It was so comfortable, I barely felt the bra and there was no bounce. That massively helped to reignite my relationship with sports. I love Shock Absorber bras; I've been wearing their bras for the past 6 years. I've loved the yellow and blue sports bra so much that I've bought it several times ( you should replace your sports bra after 72 washes - or if you're like me and don't count the washes, after 6 months). They flatten your bust and straightjacket them in without feeling tight. I love that the bra is non-wired because that adds to the comfort level and really helps me to zone in to my workout. What else I love about yellow & blue sports bra is the racerback, which not only is added support to ensure your bust stays put throughout your entire workout, it also makes sure your straps don't slip off and it really looks good! When Shock Absorber heard about my love for their brand, they kindly gifted me two of their bras, which I have been testing out in different activities. The first bra I tried on was the Active D+ Flexi Wire bra in black, which is designed for women with D -H cups. When it arrived in the post, it looked really big and I did wonder whether it would fit. I think that's because the main body of the bra is black, but the underwired section of the bra is in white and that contrast makes you really aware of the size. I didn't think I would find it comfortable, given what I said about my first sports bra. But, this is seriously the most comfortable out of the Shock Absorber bras I own. The back is like a normal bra. The straps are thick and, like with other Shock Absorber bras, the neck is circular, so if you were to wear it whilst working out as a cropped top and sports bra, you can. 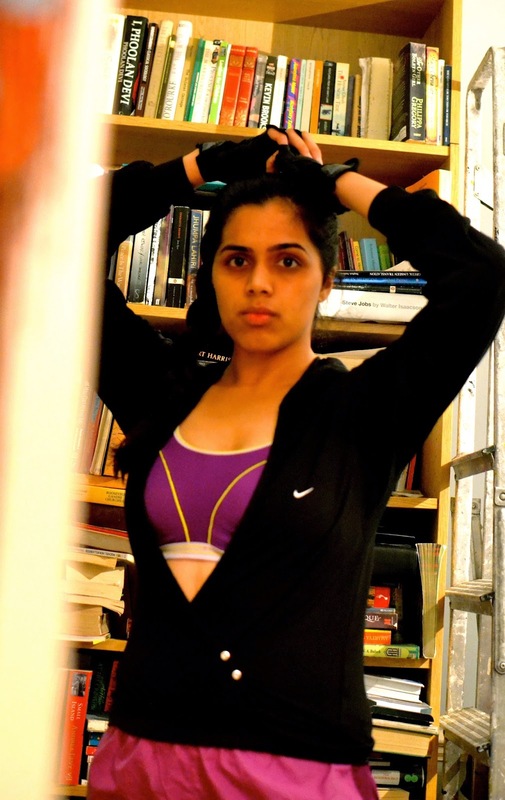 Plus, if you wear any of their sports bras as a cropped top, you look like a pro! The bra flattens your bust, but still gives it a round shape and the fabric feels very good; Shock Absorber bras are moisture-wicking, which is something you should look for in a sports bra, especially if you take part in sports that cause you to get really sweaty. Moisture wicking is basically when the fabric transfers the sweat from your skin to the exterior of the bra, so makes you feel comfortable while working out, but also your bra isn't drenching in sweat. Putting the Active D+ Flexiwire bra on is easy to put on because there is no racerback, and the three hooks-and-eye placed on the thick band made sure there was a good lift and shape. Your bust shouldn't bulge out in a good sports bra. In fact, nothing should bulge out or over the top. I wore the bra during spin classes, outdoor running, the gym and a home workout. For all those, I found the bra to be really supportive; there was only a little bounce. For this reason, I would say that the bra is probably best for spin classes, working out in the gym, pilate or yoga. Basically nothing that's high impact like running. The bra was so comfortable, I even wore it occasionally instead of my normal bras to work- and this is someone who has previously dislike underwired sports bras! I've read a few reviews by people who have said wires have poked out or the bra has fallen apart after a few weeks ownership. I've had this bra for about 2 months now, and the bra is still in great condition; it looks as good as new and ultimately still provides that support. The Ultimate Run Bra was the other bra I was gifted. One of my friends has this bra as well, so we were discussing what we thought of it. She found that it came up slightly smaller so she had to go up a bra size. I didn't have that issue, but I can see why some may have to go up a size; like my yellow & blue bra, this has a racerback, but unlike that bra, the Ultimate Run Bra doesn't have strap adjustors. For this reason, it's really important to get professionally measured for a sports bra to find out the best style and size that suits you, in terms of appearance but also the type activities you are doing; comfort and support are the two key elements when choosing your sports bra. A slightly annoying part of the bra was the clasp for the racerback; whilst the bra has clasps for a racerback, you don't have to use them, but I like using that when I do high impact sports, like running, to provide that extra support. The clasp is really hard to use, it gets very fidgety and the first few times I have had to get my mum or someone to do it for me. After a while though, you do get the clasp of it! Out of all the bras, this is perhaps the best bra for running. Running is a high impact sport, and if you're not wearing a sports bra, or a correctly fitted one, there is a chance of damage to the breast or pain when you running. There was literally no bounce; this is the Houdini straightjacket of all Shock Absorbers. I love the colour of this bra as well. Why do you need to have a white sports bra? Sports bras don't have to be boring! If you like wearing bold colours for the gym, why do your sports bras have to be neglected? With Shock Absorbers, I love that the bras come in a huge range of colours; a lot of sports bra brands neglect us girls with the bigger busts, as they sell multicoloured sports bras for smaller bust-girls and plain ones for us. Shock Absorber focus on us. They understand the importance of comfort and support as well as design. Nothing is forgone. Boobydoo (perfect for those of you in USA and the EU), John Lewis, Sweatshop, Sports Bra Bar, Debenhams and others stock Shock Absorber bras. The Christmas sales are in under 2 months time; from previous experience, Shock Absorber bras in Debenhams' sales are pretty awesome so start saving up for a few for yourself! Or, if you know someone who loves activewear, a sports bra is a great christmas present. You can wear their sports bras for your workout without a top, put them under a sleeveless top to bring a pop of colour to your sporty outfit or you can plan your whole sporty outfit around your bra. And like their motto, I don't bounce, I fly when I workout. • Disclaimer: Shock Absorber gifted me with the Ultimate Run Bra and Active D+ Flexi Wired bra. All opinions are my own.